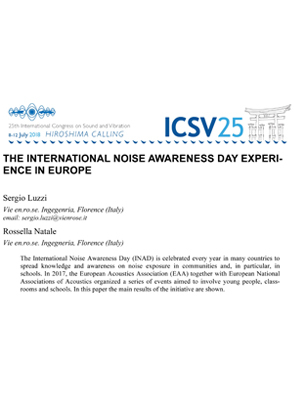 In 2017 several events and initiatives for education and awareness-raising in the field of noise have been implemented in European schools under the coordination of the European Acoustics Association (EAA), together with European National Societies of Acoustics, in cooperation with the European Commission (DG Environment), the World Health Organization (WHO) and the European Environment Agency (EEA). In many European countries, local experts and distinguished acousticians cooperated with governments and institutions, universities and schools to produce and distribute accurate and scientifically correct information on the effects of noise. In the frame of the INAD IN EUROPE program, coordinated by EAA, two pan-European competitions titled “Sounds of my place” for primary and secondary school students from all over Europe have been organized. Sounds and noises that characterize the soundscapes of the everyday life in pupils and students home-places have been painted, described, audio and video recorded, allowing the collection of more than 4000 interesting contribution. Among the other European initiatives, the cartoon “Noisella in the Sound Space”, based on original storyboard has been produced and distributed. The authors of this paper are respectively members of the EAA INAD Steering Committee and INAD National Representative for ITALY.